The Taos art colony began about 1900. American Oscar Berninghaus arrived in Taos, New Mexico, in 1899 and painted this portrait, Pueblo Woman of Taos, in 1925. People have lived in the Taos Pueblo, adjacent to town, for a thousand years. 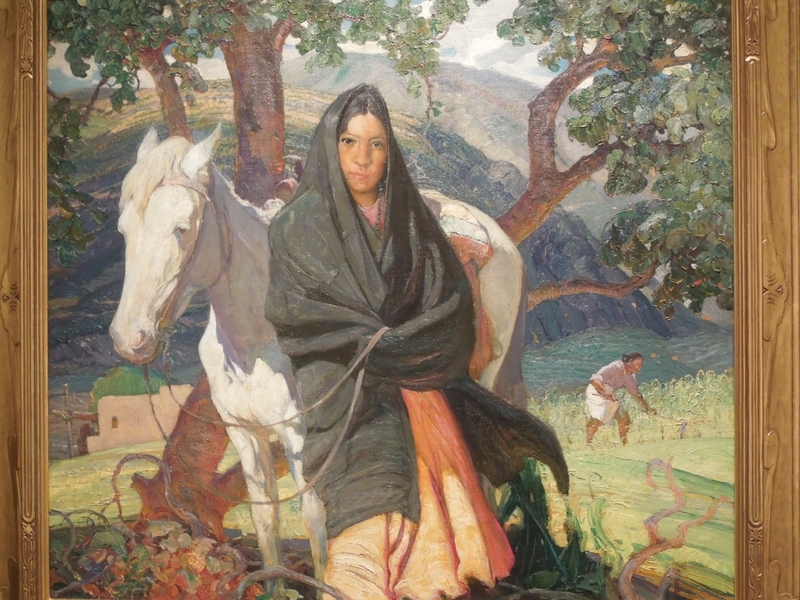 The model is believed to be Marina Martinez of Taos Pueblo, wife of an artist. Both this painting and the one below are from the Albuquerque Museum. 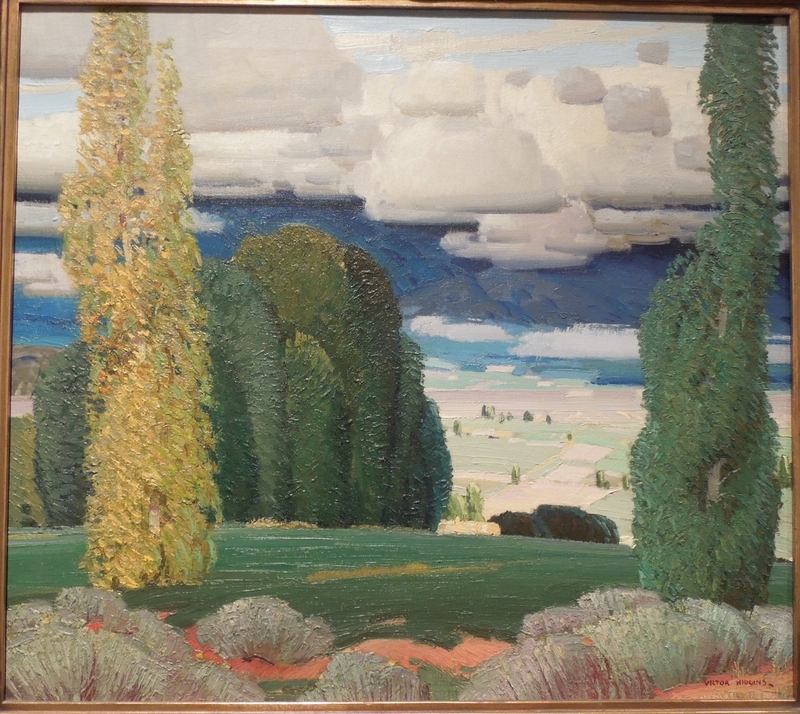 Taos Valley Landscape, below, is undated, painted by Victor Higgins (1884-1949) who came to Taos in 1914. Look how architectural this landscape is. There is red earth in the foreground, and throughout, horizontal and vertical lines and rectangles: the trees, the fields and clouds. I include the picture frame to show how the artist truncated the tops of the two tall, narrow trees on either side. Here is a detail below, with a closer view of the rectangular fields and clouds. 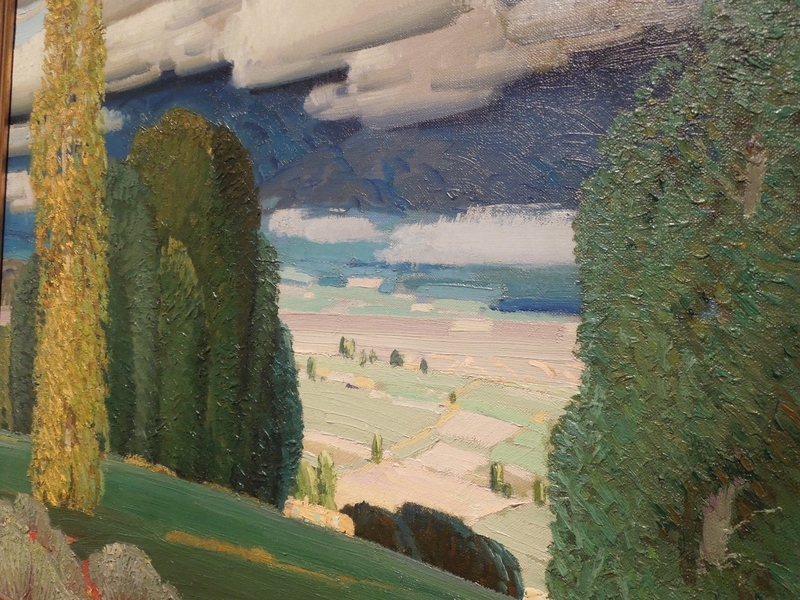 Note the brushstrokes in this detail of Taos Valley Landscape. I took these while on a tour with the 2012 Women Writing the West Conference in Albuquerque. I will post another painting from Albuquerque Museum early Friday morning. Have a good week and enjoy the beauty around us. I love the Albuquerque area, plus Taos and the Pueblo. I had a memorable visit there many years ago. I’m descended from Pueblo Native Americans. I went when I was 14 and saw a bride and groom in traditional dress come out of the Pueblo church. If anything in your visit was especially memorable, I’d like to hear it.